In an exciting development, the World Health Organization (WHO) has released its Traditional Medicine Strategy 2014-2023, with a focus on complementing Western medicine with traditional approaches, including strategies to improve safety and quality. The Director-General Dr. Margaret Chan of WHO wrote the foreword (excerpted below) and notes that “much has changed…” and that “governments and consumers are interested in more than herbal medicines….” This is great news not only for indigenous shamans and healers, but for contemporary shamanic healers as well. Across the world, traditional medicine (TM) is either the mainstay of health care delivery or serves as a complement to it. In some countries, traditional medicine or non-conventional medicine may be termed complementary medicine (CM). 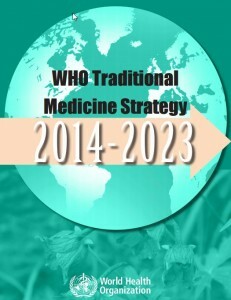 The WHO Traditional Medicine Strategy 2014-2023 sets out the course for TM and CM (T&CM) in the next decade. T&CM is an important and often underestimated part of health care. T&CM is found in almost every country in the world and the demand for its services is increasing. TM, of proven quality, safety, and efficacy, contributes to the goal of ensuring that all people have access to care. Many countries now recognize the need to develop a cohesive and integrative approach to health care that allows governments, health care practitioners and, most importantly, those who use health care services, to access T&CM in a safe, respectful, cost-efficient and effective manner. A global strategy to foster its appropriate integration, regulation and supervision will be useful to countries wishing to develop a proactive policy towards this important – and often vibrant and expanding – part of health care. Much has changed since the previous global strategy was published in 2002. More countries have gradually come to accept the contribution that T&CM can make to the health and well-being of individuals and to the comprehensiveness of their health-care systems. Governments and consumers are interested in more than herbal medicines, and are now beginning to consider aspects of T&CM practices and practitioners and whether they should be integrated into health service delivery. The WHO Traditional Medicine Strategy 2014-2023 will help health care leaders to develop solutions that contribute to a broader vision of improved health and patient autonomy. The strategy has two key goals: to support Member States in harnessing the potential contribution of T&CM to health, wellness and people-centered health care and to promote the safe and effective use of T&CM through the regulation of products, practices and practitioners. These goals will be reached by implementing three strategic objectives: 1) building the knowledge base and formulating national policies; 2) strengthening safety, quality and effectiveness through regulation; and, 3) promoting universal health coverage by integrating T&CM services and self-health care into national health systems. I am very pleased to introduce the WHO Traditional Medicine Strategy 2014-2023. It is my conviction that it will be a valuable tool for governments, system planners and health practitioners and – most crucially – will benefit individuals seeking the right care, from the right practitioner, at the right time.